Looking for a Used Durango in your area? CarGurus has 24,577 nationwide Durango listings starting at $1,000. The Dodge Durango is a full-size SUV with room for up to 7 passengers and serious towing capability. It can tow up to 7,400 pounds and just as easily serve as a family hauler, with a crossover-like ride and all the amenities a busy family needs to get through the day. The 2017 Durango offers a range of trims that take the interior from basic to beautiful. Even in its highest trim levels, however, it doesn’t scream luxury in a refined, fancy way. 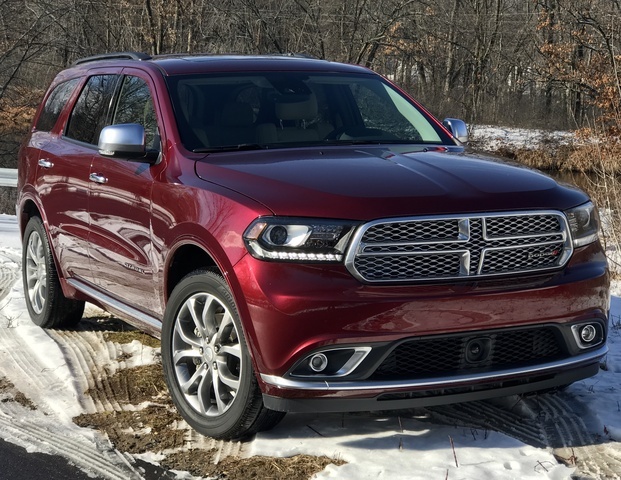 There’s a ruggedness to the Durango that fits the Dodge brand, so even when you add leather seats and rear-seat entertainment, this SUV is more about function than it is about looking pretty. 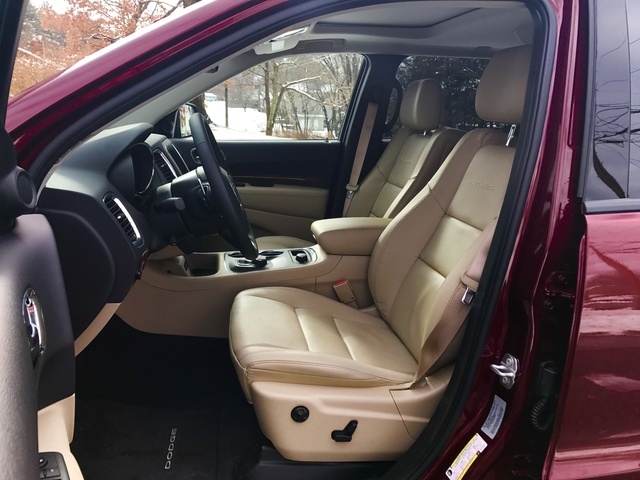 That said, you can get your Durango very well equipped, with all the features you need to keep the kids entertained and the adults comfortable. The Durango offers four trim levels—SXT, GT, Citadel, and R/T—each with a choice of rear-wheel drive (RWD) or all-wheel drive (AWD). The new GT replaces last year’s Limited trim, while the Citadel gets an upgraded Anodized Platinum appearance package. It includes two-tone Nappa leather seats; Anodized Gunmetal trim on the steering wheel, door speakers, and tweeters; and Platinum Chrome trim for the grille surround, fog-lamp bezels, door handles, exterior badging, and door sills. The base SXT starts at $29,995 and is available only with seating for five passengers. It has a 3.6-liter V6 engine with 293 horsepower and 260 lb-ft of torque with 6,200 pounds of towing capability. It includes three-zone automatic climate control, rear-seat outlets, a full-length floor console with 12-volt power outlets and a USB port, 60/40 split-fold second row, and Uconnect with a 5.0-inch screen and 6-speaker audio system. The GT features the same engine with a 2-horsepower increase and a starting price of $37,495. Stepping up to this trim level adds an 8-way power driver’s seat with memory and a 6-way power front passenger seat with lumbar for both. There are optional second-row captain’s chairs and an optional 50/50 split-folding third row to provide seating for up to 7 passengers. The Uconnect package on the GT is also upgraded with an 8.4-inch screen, and safety improves with the ParkSense rear park-assist system and rear backup camera. The Citadel starts at $41,395 and offers the same 295-horsepower V6 found in the GT or a 5.7-liter Hemi V8 with 360 horsepower and 390 lb-ft of torque. The V8 also boasts increased towing capacity of up to 7,400 pounds. Ventilated Nappa leather seats are standard up front along with a sunroof, Uconnect with an 8.4-inch screen and the addition of navigation, and an Alpine premium audio system with 9 speakers and a 506-watt subwoofer. Adaptive cruise control with stop, advanced brake assist, and blind-spot monitoring with cross-path detection are available as optional features. There’s also an upgraded Citadel Anodized Platinum Appearance Package. It includes second-row captain’s chairs, two-tone Nappa leather seats, black roof rails, platinum exterior trim, and 20-inch Satin Carbon wheels. The Durango R/T comes in with a starting price of $42,095 and is available only with the Hemi V8. This is the performance version of the Durango with antilock 4-wheel disc HD brakes, performance steering, and a sport suspension that features a lower ride height for better handling. It has unique interior treatments with Nappa leather seats that include accent stitching and an embroidered R/T logo and a BeatsAudio premium sound system as a standard feature. 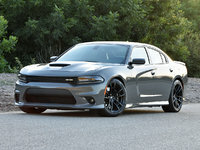 You have your choice of either a 3.6-liter V6 or a beastly 5.7-liter Hemi V8 paired to an 8-speed automatic transmission with paddle shifters. The V6 comes with either 293 or 295 horsepower and 260 lb-ft of torque. That extra 2 horsepower can be found in models with a dual exhaust thanks to an intake manifold that improves airflow. It can tow up to 6,200 pounds, making it quite capable even though it’s the smaller engine. The Citadel Anodized Platinum with AWD we tested had the V8 with its 360 horsepower and 390 lb-ft of torque, along with 7,400 pounds of towing. It's a burly engine that feels powerful from the second you push the Start button. The sound is loud without being obnoxious, and even a light foot on the gas produces quite a growl. This is not a small vehicle, and that V8 moves it confidently down the road. An Eco mode softens steering and shifts at lower revs, and a Sport mode tightens the steering and lets the revs go higher for better performance. Despite its size and that engine, the Durango doesn’t feel heavy or cumbersome. There’s no mistaking it isn’t a sedan, but its manners are more crossover than truck. It’s responsive from a dead stop and equally ready at higher speeds, with no hesitation when accelerating to manage heavy highway traffic. It provides solid stops with admirably little nosedive for such a large vehicle, and there is very little road noise, making highway drives less taxing. Driving a large vehicle can be disconcerting, with sluggish responses when you hit the accelerator and brakes that don’t stop the wheels as quickly and smoothly as expected. The Durango suffers from none of these issues and imparts a sense of confidence and control at all times. That performance comes at the cost of fuel economy, though. The Durango with the Hemi V8 is rated 14 mpg city/22 highway, which makes it rather thirsty. The Durango might not be fancy, but it has a beautiful and versatile interior. The highest trim levels feature leather with accent stitching, and even the lower trims feature appealing materials that are pleasant to the touch and the eye. The interior is clean and uncluttered, with well-organized controls and an easy-to-use Uconnect infotainment system. The 8-way power front seats are roomy and supportive with great adjustability, so even shorter drivers will be able to see over that large hood. They also feature lumbar support which provides plenty of stiffness to help ease sore backs, especially on longer trips. The second-row captain’s chairs are equally comfortable, though they don’t feature the adjustability of the front seats. They have armrests and a center console that has plenty of room for holding drinks, the remote for the optional rear-seat entertainment system, and whatever random bits your kids simply cannot do without for the day’s drive. A second-row bench seat is available instead of the captain’s chairs and adds room for one more passenger. The third row has room for two and is the least comfortable of the lot, but still provides a pleasant space. Even adults will be fine, with lots of shoulder and headroom and even legroom, which is often ridiculously tight in the third row. It’s easy to access, but does require stepping around the folded second row, making the third row best for more agile passengers. 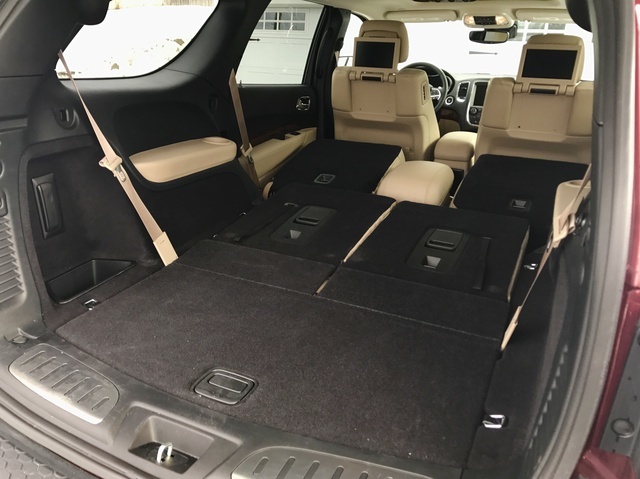 If it’s cargo and not people you’re concerned about, the Durango offers up to 84.5 cubic feet behind the front row with the rear seats folded. It has 47.7 cubic feet behind the second row and 17.2 cubic feet behind the third row, so even loaded with people, it has room for cargo in the back. Add a towing capacity of between 6,200 and 7,400 pounds, and it’s easy to take a car full of people and all their stuff on an adventure. 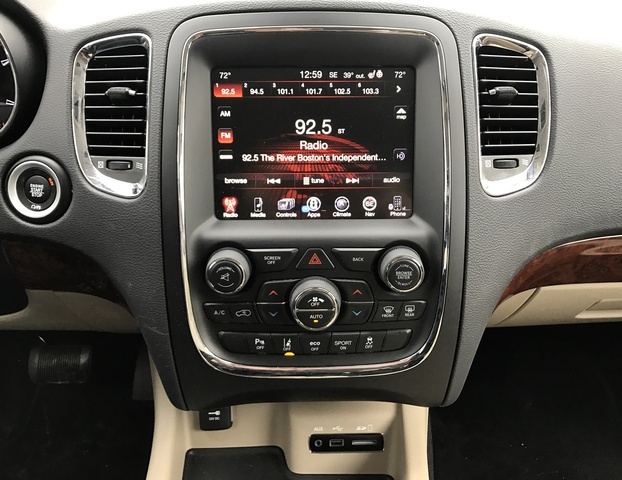 The Durango features FCA’s Uconnect infotainment system, which is fantastic. It includes either a 5.0-inch or 8.4-inch touchscreen with a standard 6-speaker audio system, SD card slot, USB port, auxiliary jack, and two 12-volt outlets. Available features include a CD player; SiriusXM Radio, Traffic, and Travel Link; a 9-speaker Alpine audio system with a subwoofer and 506-watt amplifier; and a BeatsAudio premium sound system. There is no Apple CarPlay or Android Auto compatibility. The lack of those last two features might seem like a major drawback. It’s disappointing, as they can be found elsewhere in the Dodge lineup, but Uconnect picks up the slack. Uconnect is the most intuitive infotainment system available. The touchscreen features icons that quickly take you to the desired menu where additional choices are displayed in a logical manner. It takes no time to learn and reduces the frustration and hassle of figuring out other systems. The steering-wheel-mounted controls in the Durango add to the system’s ease. There are buttons on the back of the wheel, right where your fingers rest. These let you quickly adjust the volume, scroll through radio stations, and switch between presets. There’s Bluetooth streaming, voice command, and a rear-seat entertainment system with dual screens in the backs of the front seats to keep the kids busy. It’s easy to find the features you want either by opting for a specific trim level in the Durango lineup or adding one of several available packages. A combination of standard and available safety features for the Durango includes the latest autonomous technologies. Every Durango has multiple airbags, electronic stability control, hill-start assist, rain brake support, ready alert breaking, and trailer-sway control. Optional features include adaptive cruise control with stop, advanced brake assist, blind-spot monitoring with cross-path detection, forward-collision warning with active braking, ParkSense rear park assist and rear backup camera, and LaneSense lane-departure warning. The 2017 model year Durango has not been tested by the Insurance Institute for Highway Safety, but the 2016 model year received its top Good rating in all categories except for Small Front Overlap. In that one category it received only a Marginal rating. That's not what you want to hear when you're looking at what is essentially a family car responsible for keeping your kids safe when things go wrong. The Durango also received a Good for head restraints and seats along with Basic for its front crash-prevention technologies. The National Highway Traffic Safety Administration gave the 2017 Durango 5 out of 5 stars in side crash testing, but only 4 stars in frontal crash and rollover tests to earn an overall rating of 4 stars. Again, safety ratings aren't where most people would like them for a vehicle that will carry a whole family. The Durango’s large size and powerful engines lend the driver a sense of confidence behind the wheel. Sure braking and solid handling add to that confidence level. The optional AWD is a must for those who live in colder regions and will make snowy slogs to school a lot less stressful. Despite its lackluster safety ratings, the Durango's handling and power make it a car you won't feel nervous driving. It's large, but not unwieldy and nicely controlled at all speeds. Although the Durango has a reasonable starting price of $29,995, it doesn’t take much for that price to creep up to the $60K mark. 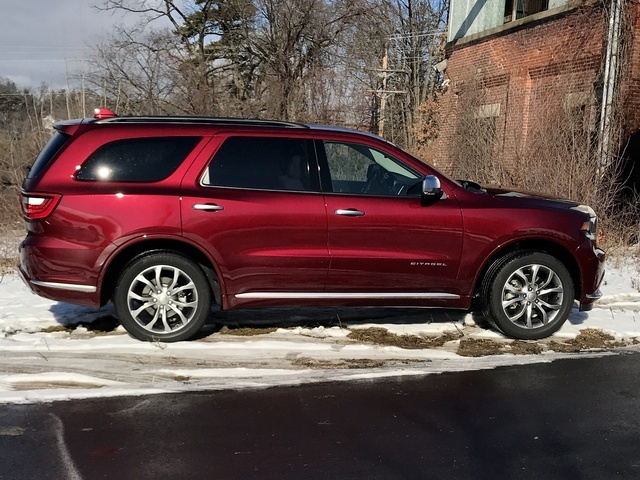 Whether it’s opting for that Hemi V8, packages that improve interior amenities, or advanced safety, the cost of your Durango will likely be a good bit higher than that base number. If you're on a budget and you don't want all the whiz-bang stuff, then you'll be happy. If you're looking for every gadget you can possibly get, then brace yourself for that final price. The Durango also doesn’t have great fuel economy, with the V6 AWD rated 18/25 and the Hemi coming in at 14/22. That might not be a big deal if you’re driving only a short commute or shuttling kids around town, but it’s going to hurt the first time you head out for a family road trip. We averaged 21 mpg in primarily highway driving. Load it down with people or hitch up a trailer and those numbers will fall. It’ll be hard not to keep a wary eye on gas prices when you’re driving the Durango. 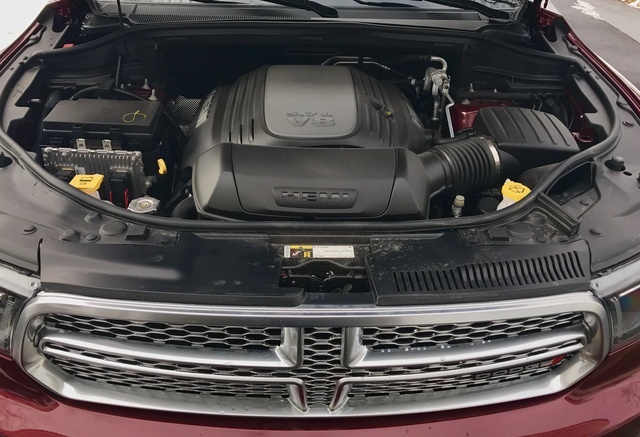 On the plus side, the Durango includes a 5-year/60,000-mile powertrain limited warranty, 3-year/36,000-mile basic limited warranty, and 5 years/60,000 miles of roadside assistance. Nicole Wakelin's passion for cars started on the day she went for a ride in a bright red Ferrari as a teenager. She writes reviews and covers everything cars for CarGurus, The Boston Globe, BestRide, AAA, Autobytel, and numerous other outlets. What's your take on the 2017 Dodge Durango? Cayman_1963 It's the worst vehicle I've ever driven!! I love the car but at 2000 miles ( that's 2,000) had to have the 1 & 6 lifters rebuilt. 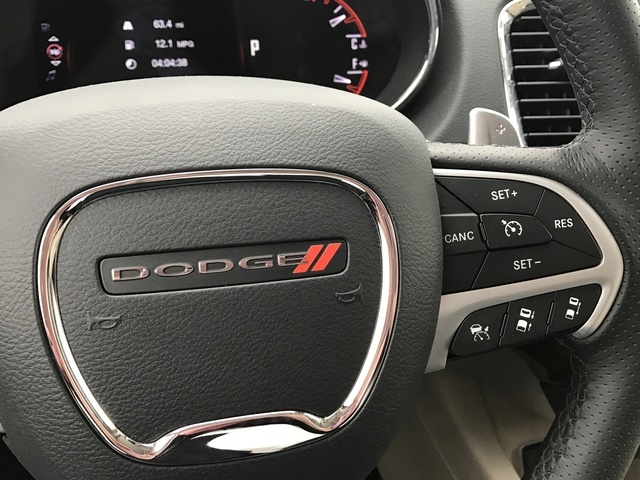 Dodge doesn't back their products. They've had my car for 17 out of the 45 or so days I've had it. So disappointing. I had a 2000 durango that did almost 300,000 miles before giving out, this one, I'll be luck to make it to the first oil change. Have you driven a 2017 Dodge Durango? Door Handle Unlock And Lock Button Does Not Work! I have a 2017 dodge Durango RT my door locks do not work, is this comment on this vehicle? Does anyone have any recommendations of what I should do?